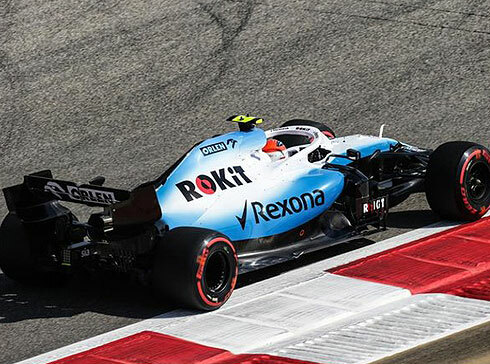 The opening Friday practice session for the 2019 Bahrain GP would see both ROKiT Williams Racing drivers finish again at the bottom of the times so it was very much a case of the situation for the Williams team being unchanged. 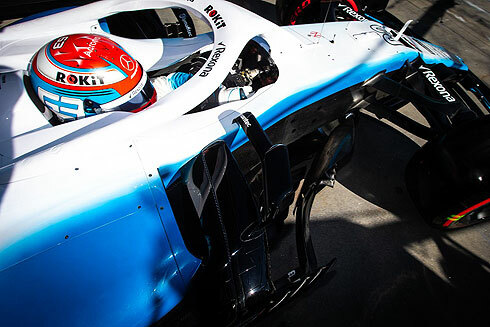 George Russell would again finish ahead of team-mate Robert Kubica with the pair 19th and 20th. Both drivers would set their quickest times on the medium tyre in a session that saw both drivers focus on using the medium tyre. Both Williams racing drivers would complete their installation laps with the track emptying. Pirelli had brought the three hardest tyres in their range but they were still marked as hard, soft and supersoft. The first time of the session would be from Verstappen with a 1m:33.085 running on the supersoft tyre. Both Williams cars would return with an hour and ten minutes remaining. Bottas would go quickest with a 1m:32.340 with the Williams drivers currently 9th and 10th. Both Williams drivers would improve their times but would drop down the order to be 17th and 18th. Vettel was now quickest with a 1m:32.299 from Bottas and Leclerc. Hamilton was fourth followed by Verstappen, Albon, Hulkenberg, and Magnussen eighth. Leclerc was now second followed by Bottas. A 1m:31.747 from Vettel with Leclerc still second. The Williams drivers were now in 18th and 19th and both would pit after the opening forty minute period. Verstappen would improve to set a 1m:31.673 running on the supersoft tyre. Vettel was now second and Gasly now third after a supersoft tyre run. Bottas would go quickest with a 1m:31.328 also on the supersoft tyre. Vettel would also improve with a 1m:30.617 to be quickest. Bottas was now second followed by Hamilton, Verstappen and Gasly. The Williams drivers would remain 18th and 19th with 25 minutes remaining in the session. At the front Leclerc would go quickest on a supersoft tyre run with a 1m:30.354, followed by Vettel, Bottas, Hamilton, Verstappen, and Gasly. The Williams drivers were now 19th and 20th. 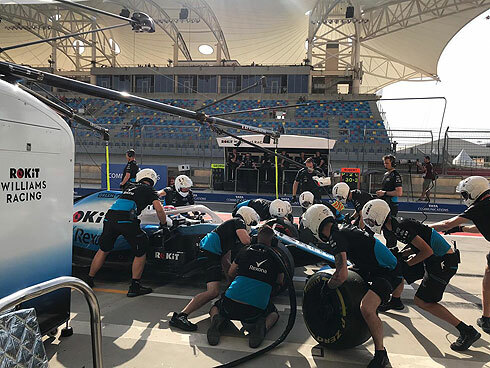 Both drivers would complete runs on the medium tyre as the session came to a close. Robert would take to the track first for the opening Friday practice running on the supersoft tyre. Robert would return again on the supersoft tyre. A 1m:36.857 from Robert and after a few laps he would improve with a 1m:35.988. Another improvement from Robert with a 1m:35.592 and would pit after an eleven lap run. Robert would return this time on the medium tyre. A 1m:34.253 from Robert would see him improve to be 16th. But would would drop to 19th to be behind George. He would pit after a nine lap run on the medium tyre. with ten minutes remaining Robert would return on a new set of medium tyres. He would complete a further run on the medium tyres completing 27 laps at the end of the session. George would follow his team mate out but was on the hard tyre. George would also return running on the supersoft tyres as well. George would set a 1m:35.634 to move ahead of his team-mate. George would set a 1m:35.205 to improve to be two places ahead of Robert. George would pit after a ten lap run. George would also come back out also on the medium tyre. George would set a 1m:34.188 to also be quicker on the harder tyre. George would also pit after a nine lap run on the medium tyre. George would also return with eight minutes remaining also on the medium tyre. George would spin at the exit to Turn 2 when he went to applying power in what was a simple error. George would complete 26 laps at the end of the session.